Ages 4 and up.. 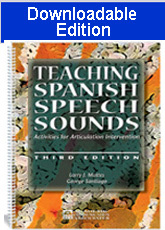 The third edition of this popular book includes drill activities, reproducible picture cards, and game boards that can be used to teach the Spanish consonant sounds to individuals with articulation disorders. The drills for individual sounds are organized by word position and provide practice at the word and sentence level. The stimulus pictures provide opportunities to practice speech sounds in various word positions. The reproducible pictures and drills can be used at school or in home programs.